Each year, half a million people attend 3,000 events in Britain’s biggest ever environmental occasion. 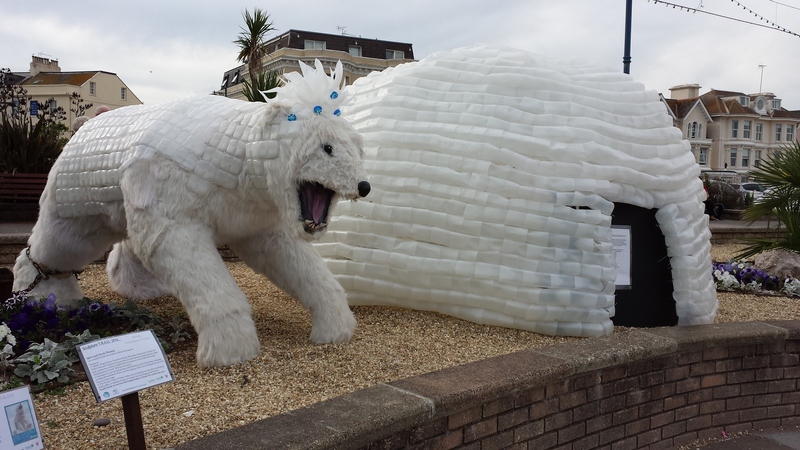 Igloo and Arctic Warrior at the Teignmouth Sculpture Trail – our wonderful polar bear ready to defend his Kingdom. Thanks to TRAIL, Holcombe Community Orchard and TAAG Arts and Community Centre for help in constructing the plastic milk bottles to make the igloo. And to all those who brought empty milk bottles to us! Thanks also to Greenpeace for generously giving us the polar bear used in their Arctic Campaign at Glastonbury Festival which, once the sculpture tail is over, will spend the rest of his days at Living Coast. Interesting programme shown on BBC 2 last November but still available online. Entertaining programme worth a look – using data in an entertaining way to show how population growth and world poverty are changing. Don’t Panic – The Truth About Population was produced by Dan Hillman. It was originally commissioned for BBC2’s This World and is made in partnership with The Open University and UR (Swedish Educational Broadcasting). There does seem to be a recommendation that local authorities should no longer be required to measure and report on air quality which might be of concern. Responses need to be in by Sept 13th.